This website is for hill walkers and scramblers but not for rock climbers. Spain is a large country with many different landscapes and climates. It can be hot in summer and cold in winter. Walking is seasonal according to the areas. The north-west has an Atlantic climate, unsettled like the UK, but generally warmer. Central and southern areas are drier and hotter, although inland Spain can be cold in the winter. So, walking should be planned according to the regions and the seasons. Generally speaking, the walking season for the far north is summer and autumn. For the rest of the country it is from September to May. In the south, mid-winter can be an excellent time for walking, generally with moderate temperatures, clear skies, and daylight until 6pm. Although the seasonal climate is predictable, the weather in any individual day or week is not. If you are going into the hills, you need decent walking gear. Lightweight is usually preferable, but boots or good quality walking shoes, plus waterproofs and layers of clothing are essential gear. Walking poles are also very useful. Do not go to high levels in the north from December until early June, unless you have winter skills and equipment. In central Spain, for example just north of Madrid (although there is less snow than in the far north), there can be fresh and deep snow at altitudes above 1500 metres until as late as May. For a small charge of £10 (which goes towards covering my costs) I can provide quickly, by email, a comprehensive series of walks for each of the following areas. Contact me on info@spanishtrailsco.com for details. Pyrenees (Ordesa national park and over the border into France); Picos de Europa – (and you can see more information about my book here); Somiedo. Sierra de Guadarrama; Sierra de Cazorla. Sierras de Tejeda and Almijara; Los Alpujarras. I also have a series of individual walks in places such as the Sierra Sub-Betica, the Sierra Norte of Seville, and the area to the north-east of Madrid. 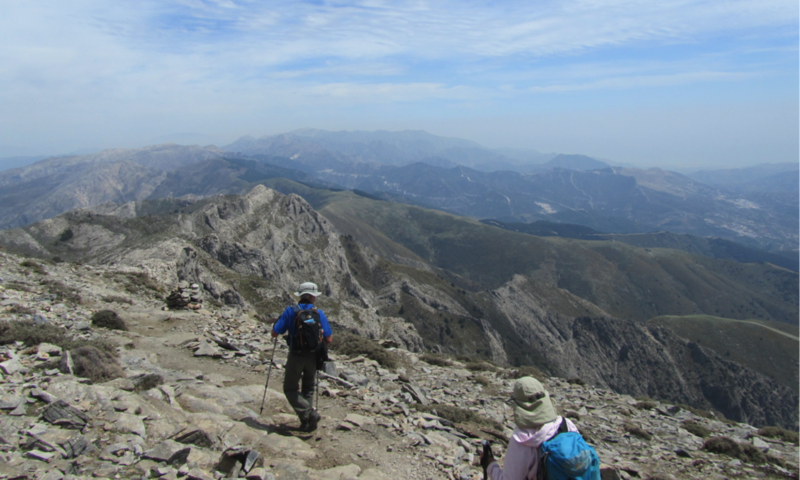 I am publishing a series of guidebooks providing walks in several areas of Spain. You can find out more about my publications and my walking experience on this site.